The Expo Group awarded Amy Schwandt of AC Business Media with its Tier III Show Manager of the Year Award (SMOTY) for her outstanding efforts as show manager for National Pavement Expo. Schwandt led the sales team to increase the National Pavement Expo show floor by 50% and achieved an amazing 66% increase in attendance over the past two years. 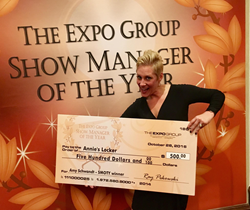 Amy Schwandt, The Expo Group’s Tier III Show Manager of the Year award winner, received a donation in her honor to the charity of her choice: Annie’s Locker. National Pavement Expo Show Manager Amy Schwandt led the sales team to increase the show floor by 50% and achieved a 66% increase in attendance over the past two years. The Expo Group awarded Amy Schwandt of AC Business Media with its Tier III Show Manager of the Year Award (SMOTY) for her outstanding efforts as show manager for National Pavement Expo. The award was presented on Oct. 29 during The Trade Show News Network Awards in Atlantic City, New Jersey. 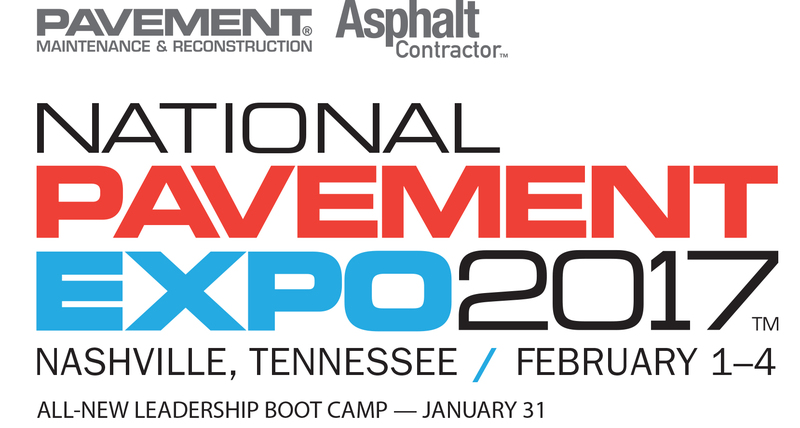 National Pavement Expo is held annually in the first quarter of the year for paving and pavement maintenance contractors. The 2017 show will be Feb. 1-4 in Nashville, Tennessee. Schwandt has led the sales team to increase the show floor for National Pavement Expo by 50% and achieved a 66% increase in attendance over the past two years. Schwandt is committed to helping her customers build their brands and generate revenue. She also manages the sales, customer development and growth of Asphalt Contractor and Pavement Maintenance & Reconstruction magazines. The five show managers honored as Show Managers of the Year were chosen for making a difference in their buyer-seller communities and for bringing passion to their work. Award winners received a donation in their name to the charity of their choice as well as the iconic SMOTY obelisk trophy. Schwandt chose to donate to Annie’s Locker, a non-profit organization that supports people in need of proper fitness gear and provides race scholarships in Rockford, IL. The awards are judged by an independent panel and are open to anyone responsible for the production of an event with exhibition space, regardless of any affiliation with The Expo Group. Nominations are accepted year-round at TheExpoGroup.com. The annual expo is the largest conference and tradeshow for paving and pavement maintenance professionals. Conference sessions and exhibits feature business management, paving, sealcoating, crack repair, striping, sweeping, pavement repair, concrete and snow removal. The expo is sponsored by Pavement Maintenance & Reconstruction, Asphalt Contractor and ForConstructionPros.com, as well as AC Business Media Construction Network brands. The 2017 expo in Nashville, Tennessee, will have conference sessions Jan. 31-Feb. 4; the exhibit hall will be open Feb. 1-3.